Alan Kolok, author of Modern Poisons: A Brief Introduction to Contemporary Toxicology, breaks down the Toxic Substances Control Act. The Toxic Substances Control Act (TSCA), the nation’s primary chemical management law, was in need of a makeover. Fortunately, on June 22, 2016, President Obama signed the Frank R. Lautenberg Chemical Safety for the 21st Century Act, amending the TSCA, and by doing so, strengthening the regulation of potentially toxic chemical substances. The regulation of potentially toxic chemicals is not one size fits all, but rather is nuanced, as different chemicals are covered by different pieces of legislation. There are specific Acts that regulate pesticides, foods and food additives, drugs, cosmetics, tobacco and tobacco products, nuclear materials and munitions, and for that reason none of those chemicals are covered by the TSCA. Rather, the TSCA regulates chemical substances that are of commercial value to industry, whether they are natural or man-made synthetics. Given that the TSCA does not cover a wide range of important chemicals designed for personal use or consumption, you might think that the number of regulated chemicals that fall under its domain would be small. However, that is not the case, and the sheer chemical bulk, in both numbers and mass, which are controlled by the Act is impressive. The Act covers no fewer than 83,000 substances, and the overall annual production or import of these chemicals by the United States exceeds 15 trillion (yes, that is trillion with a “t”) pounds. One of the charges outlined by the original TSCA, first passed in 1976, was the creation of a chemical list, the Chemical Substances Control Inventory. Basically, the Inventory is one long list of chemicals covered by the Act. The Inventory includes a wide variety of chemicals, both organic and inorganic chemicals, as well as polymers and chemical substances of unknown or variable composition. The TSCA allowed the government to do more than put together a list, as the Act also allows the federal government to regulate a chemical’s use and to enforce that chemical companies conduct research on the chemicals to verify environmental safety and the lack of adverse impacts to human health. But as well minded as the original TSCA was, it was plagued by many of the same problems that other pieces of safety legislation have wrestled with. One such issue relates to legacy chemicals and grandfathering. Of the 83,000 chemicals covered by the Act, no less than 62,000 were in use prior to 1976, meaning that they were legacy chemicals existing well before the TSCA was inked. As a group, these chemicals were ‘grandfathered in’ and considered compliant without any retroactive testing to assure that they were safe. This meant that nearly three quarters of the chemical substances listed on TSCA’s Inventory were not tested relative to their adverse environmental or human impacts unless there was a specific reason to do so. For these chemicals to be tested, the EPA had to demonstrate that they posed serious health or environmental concerns. Without that indictment, the chemicals were simply considered innocent until proven guilty, shifting the burden of proof regarding the adverse impacts squarely onto the EPA. A second issue with the original TSCA was that it weighed economic benefit against environmental or human health concerns, creating a very uncomfortable cost-benefit analysis that had to be taken into consideration when a chemical substance was being taken off the market. But just how much economic benefit overweighs environmental or health concerns? Rather than innocent until proven guilty, the cost-benefit analysis was more of an ‘innocent if wealthy enough’ clause, no matter how toxic the substance was. U.S. 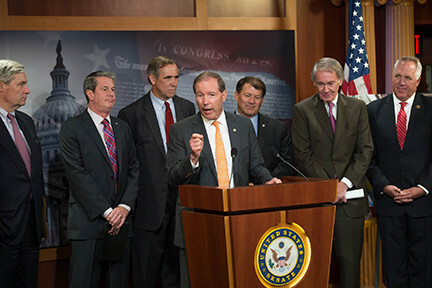 Senator Tom Udall (D-N.M.) and other politicians speak at a news conference in the Senate Radio & TV Gallery after the Senate's decision to send the Toxic Substances Control Act to the president the previous night. Photo credit: Senate Democrats via Flickr. The Lautenberg Chemical Safety for the 21st Century Act was written to allay some of these concerns. The new Act increases the dollar value of the fines that the EPA can impose upon a chemical company that breaks the law by releasing toxic substances onto the market or into the environment. Furthermore, the Act also gives the EPA more authority to stop the production of a new chemical if the EPA determines that it would not meet safety regulations. In addition, the Act does away with the mandatory cost-benefit analysis between adverse impact and economic benefit of using the chemical. As a result, chemicals won’t necessarily be saved from banning or phase-out solely due to economic returns. A second limitation associated with the Act is in its implementation. There are as many as 1,000 chemicals currently within the Inventory that are in need of safety reviews, but the new legislation does not supply the funds to support such a massive testing effort. Rather, the Act mandates that within the next five years the US Environmental Protection Agency only has to list 25 high priority and 25 low priority compounds to be reviewed. This does not mean that these compounds (which represent less than 3 percent of all compounds that should be tested) will be tested, but only that they will be listed as needing testing. The only real safety net that prevents toxic chemicals from entering our food, our drugs and our personal care products is comprised of a series of legislative Acts. On a federal level, the Food, Drug and Cosmetic Act of 1938 really started it all off. Since that time, other legislation, as well as the amendments to the original 1938 act, have helped to tighten the safety net, safeguarding the quality of our food supply, our pharmaceuticals, and our personal care products. The TSCA, along with the Lautenberg Chemical Safety for the 21st Century Act, are designed to provide an assurance that chemical substances used by industry to synthesize many products within our manmade environments are safe. While not perfect, the Lautenberg Act definitely modifies the TSCA, and by doing so improves upon it. The history of all of these pieces of legislation reveal that they adapt by changing in fits and starts, rather than being ironclad right out of the box. Unfortunately, the enactment of these pieces of legislation has often been preceded by a tragic event, elucidating the inadequacies within the current legislation. Historical tragedies associated with elixir sulfanilamide, thalidomide and with diethylstilbestrol clearly bear all prompted legislative action to tighten the overall chemical safety net. While the creation of the Lautenberg Chemical Safety for the 21st Century Act was not precipitated by tragedy, its creation does, nonetheless, follow the classic trajectory of chemical safety legislation in general. While not perfect, its enactment into law represents an incremental increase in the overall safe use of the chemicals under its authority. In that way, it is a positive, albeit small, step forward. Alan Kolok is Isaacson Professor of Research, Director of the Center for Environmental Health and Toxicology in the UNMC College of Public Health, and Director of the Nebraska Watershed Network at the University of Nebraska at Omaha. He is also the author of Modern Poisons.